I wanted to start off with one of my favorite products to gift and get during this time of year, bath and body items! Last December I talked about a great etsy store named Spa Thyme, a brand that makes all natural spa-themed products at incredible prices. The owner Nancy is so sweet, and creates all these products herself! I've been using her products for over a year now and can say I am SO obsessed with everything she makes, although I'm definitely a sucker for her body scrubs! I recently had the chance to try some new products from her and I think they would make the perfect little gift set for Valentines Day! These two products compliment each other perfectly! I love the fun aspect of the Champagne Bubble Bath (I mean how cute is that packaging?!) and it smells so good! It's light and great for all skin types, and the natural oils in it help to make you feel soft and feeling fresh all over. I've been using the two together since they both have that 'champagne' scent. The Mimosa Bosdy Scrub has a very similar scent to it, but also has some citrus to it. I'm a big fan of citrus scrubs because they tend to wake up my skin and give it a little more glow than other scents. This one again is perfect for those of you with sensitive skin since there aren't any harsh chemicals. Like I said I'm a big fan of Spa Thyme's body scrubs, especially because the weather here in Southern California makes my skin SO dry. It's the best way to get rid of any dry skin that I have! Now some people might not be big bath or spa product lovers, and that's totally fine! I've rounded up some of my other favorite gift ideas for y'all below! What are your favorite things to give or receive on Valentines Day? 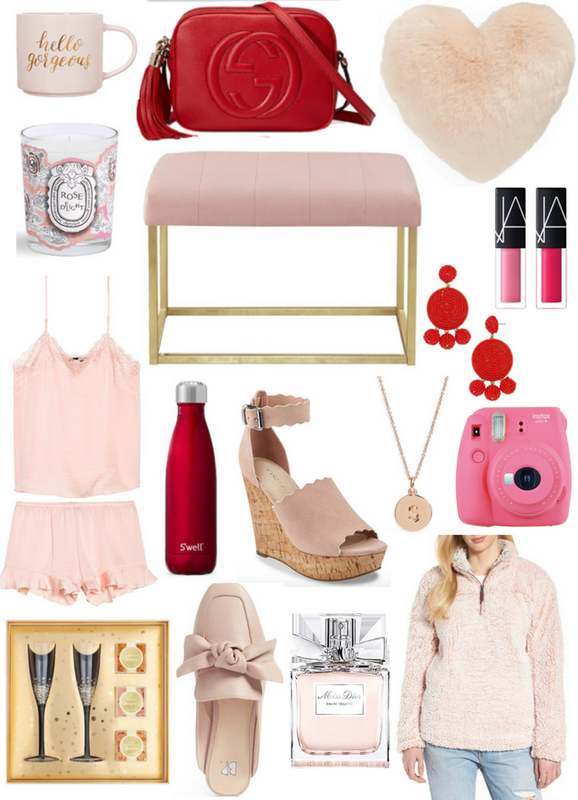 Valentine's day is just going to be another excuse for me to pick up all the blush pink items! Great list. wait i totally want to buy that gucci bag for myself haha love the guide you put together! What a sweet gift guide! I love doing galentine's day. An initial necklace would be such a cute gift! I love those blush mules and that PJ set! These are all such great picks. Ummmm, I need that mimosa body scrub, and the mug, and the nars lip duo, and everything else! LOL! I'll take one of each, please. That red Gucci bag is perfection. Champagne bubble bath sounds so luxurious. I love treating myself to a hot bath! I also love those silky pink pajamas, so so cute! Such cute gift ideas!! Love the PJ set & candle. My sister has the mug you linked and its her fav! These are all so cute babe!! I am loving the mules! Wow, that champagne bubble bath looks awesome and would make a great gift. I love the heart pillow too! Love this post!! So many cute things I now want for myself lol! I definitely need to get those pjs and coffee mug! Such great finds!! how dreamy are these gifts??? i love those BP mules! These are such cute ideas! I love that heart pillow. I really need to get better at decorating. Oh my gosh, I havent had a good bubble bath in forever! Can I just buy it for myself?!LOL. These are all great picks! Such a great set of gifts! You've covered everything from pampering to indulging - love it! This looks so sweet and fun! 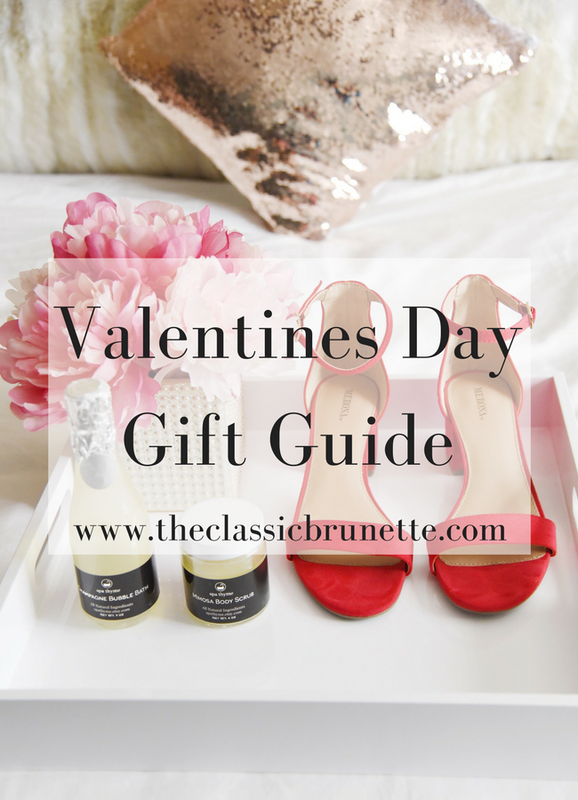 What I love most is that it is stuff that you can honestly get yourself for the day of love! Thanks for the share! I love the wedges you linked! Prerana || Broadcloth - Style for the modern career woman. Great gift ideas! 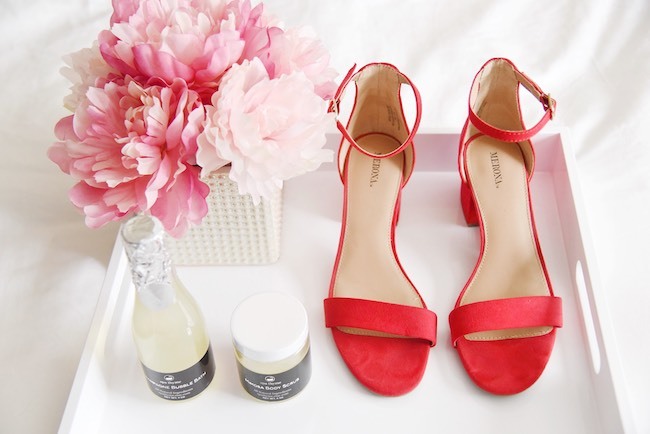 Love the blush wedges!